Do you have a dead end job where there are few, if any, opportunities for promotion? If this describes you, there are still opportunities to make a career transition to pursue the job you've always wanted. To make a career change, you might have to obtain more education. Whether you enjoy learning or want a higher paying job, continuing education can be pursued at anytime during one's working life. In fact, continuing education can open up previously closed doors or lead to better job opportunities. Continuing education usually refers to college courses or other vocational training obtained by older adults or working professionals. This has been corroborated by research, which finds that students in continuing education programs are usually older adults or working professionals. 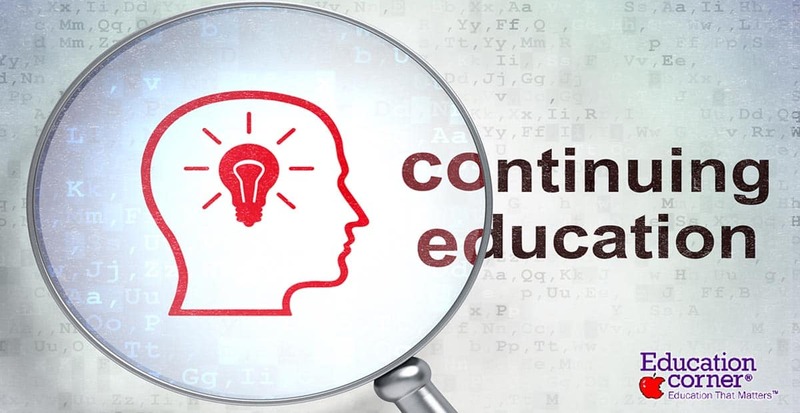 Economic conditions are one of the main reasons driving demand for continuing education, and many people enroll in continuing education programs during recessions. Likewise, during recessions, many workers seek to improve skills to remain hired or find new job opportunities. There are many wide-ranging reasons why you might want to consider getting additional education. From better wages to personal improvement, here are just some of the reasons that you might want to consider going back to school. According to the Bureau of Labor Statistics, the outlook for those with a master’s degree is quite positive. Although graduate degrees won’t necessarily improve wages in all fields, a master’s degree still leads to increased wages in numerous jobs. For instance, logisticians with a bachelor’s degree earn $54,000 annually while those with a master’s degree earn $82,000 annually. Similarly, marketing and sales managers earn $80,000 annually with a bachelor’s degree while those with a master’s degree earn $110,000 annually. These are just two examples of how a graduate degree can help improve wages. The Bureau of Labor Statistics identifies STEM fields, business, education, and healthcare career as areas where a master’s degree is commonly a vehicle for increased wages. However, there are many other jobs where a master’s degree will help. Librarians, fitness workers, and public relations specialists are just a few additional examples where those with master’s degrees earner more than those with a bachelor’s degree. Whether you should pursue a master’s degree should begin with an assessment of whether you think it will actually help your during your career. You should consult with people who have experience in your field and research whether a master’s degree will actually benefit you. If not, you might want to look at other ways of improving your career outlook. A master’s degree requires a significant time and financial investment, so make sure that the investment will pay off before you enroll in any classes. Additional education can result in a master’s degree while at other times may result in a professional certificate. Each has its own advantages. A graduate certificate requires a smaller commitment. Less time and less money is needed to complete a certificate program, but the certificate still shows that a person has invested in additional education that makes them better prepared for a professional career. Master’s degrees may be more appropriate in specific fields. Regardless of whether you get a master’s certificate or degree, obtaining additional education can increase one's marketability in the job market. In the first place, a mater’s education is sometimes the minimum requirement for taking a job in certain fields. Your job marketability immediately improves with certain kinds of additional education because it qualifies you for additional jobs that you would otherwise be unable to qualify for. Professors, adult teachers, consular, consultants, and professional administrators are just some of the careers that require applicants to have a master’s degree. However, you’re more likely to get hired in general, even by jobs that require only a bachelor’s degree, if you have a master’s education. Studies suggest that getting a master’s education is associated with increased employability. The increased education positions you to be more competitive in the hiring field and increases the chances you’ll be hired versus your peers who only have a bachelor’s degree. It is important to note that a master’s degree is not a guarantee that you’ll be more likely to get hired. As reported by Rebecca Ratcliffe, not all careers benefit from additional education. Also importantly, you’ll want to make sure that your master’s education is as applicable as possible for the job you’re applying for. Applying for a job with a master’s education that is only partially relevant won’t benefit you much. In fact, hiring managers may look at you much the same way as they would applicants who only have a bachelor’s degree. One of the ways that you can increase your competitiveness in the job market, even when it’s not immediately clear what advantage your master’s degree gives you, is by spelling out for your potential employer just how the skills you possess will help you in your new role. Skills like critical and lateral thinking, for instance, are needed in a variety of roles. In other cases, the research skills you gained might make you a valuable addition in a specific career as well. You need to make the value of those skills clear both in your resume and during your job interviews. By doing so, you’ll only increase the likeliness that hiring managers will bring you onboard versus the other applicants you’re competing against. Continuing education is a good way to develop new skills or knowledge necessary for a career transition. You won’t always need to get additional education when you want to switch careers. However, there are some cases where the extra education will definitely come in handy. If you’re hoping to switch up careers, you’ll first want to study up on whether additional education will help. The first step in your career transition should consist of studying up on the new job you’re hoping to apply for. It’s important to know what the current job market is like and how competitive it will be for you to get a position. If the field is particularly competitive, than additional education may be particularly important. Getting more education could mean the difference between getting the job and not. If it does seem as if more education could help, then look into what skills, specifically, would help you to transition. Once you know what skills will be required in your new job, you’ll want to gauge just how much additional education that you’ll need. Sometimes, you might be able to make the transition with a brief investment into a mater’s certificate. This would save on significant time and money that would otherwise be needed to get a master’s degree. If a certificate is all you’ll need, you may be able to transition into your new career more quickly. Importantly, you’ll want to determine what skills you can acquire from the experience you get while you’re working versus what skills are best acquired through schooling. This will help you determine what courses you need to take. It should be clear that making a career transition is much like beginning your professional life all over. For that reason, it’s important to be well read on the path you’re choosing. By understanding the competitiveness in your field and how specific skills will help, you’ll be positioned to understand what additional education will best enable you to succeed after you’ve begun your transition. You might not always want to get more education just because it helps you in your career. Instead, continuing education is a great way to learn about subjects of personal interest. Courses taken do not necessarily have to be related to an individual's job. Courses can be taken for a much more affordable cost at community schools instead of at university, so for many people, this is a great way of receiving additional education without all the costs associated with university attendance. If you love your job but have always had a passion for studying history, this is a great way of encouraging the amateur historian inside of you. Similarly, if you’ve found yourself more and more interested in science lately, taking courses can be a doorway toward learning more about the scientific process. The possibilities are endless, and every year, schools mix up the courses they offer to reach a broader audience. Even if you’re only taking a class for personal reasons, you may find that you learn things that help you during your day to work routine. Critical thinking skills, time management, and the ability to problem solve are just some of the valuable skills that people learn when they’re back in school. Additional education is great not only because it helps you explore your own personal interests but because it sharpens up skills that can help you in your daily life. If you’re choosing classes out of love for a subject, it’s still worth doing a little research to find out what courses you’ll enjoy the most and which ones will work best together. Instead of taking a hodge podge of course that are only slightly related, you can take a series of courses in one field that build on one another. To return to the example of taking history courses, you might choose to focus all your studies in 20th century America. This can help you become extremely knowledgeable in a specific part of the field you’re most interested in rather than taking an assortment of courses that give you a broad but shallow understanding of that field. Sometimes, additional education can help improve your own image with the people you spend the most time with. Obtaining more education can improve your image in both your family and social circles. After all, additional education equips you with new skills and education that you can use to contribute among those you know. Additional education is beneficial for more reasons than just the skills and knowledge you acquire, though. Obtaining additional education or completing a college program can enhance self-image and have positive effects on other aspects of a person's life. Generally, getting more education is a great way to improve your own confidence and belief in yourself. An increased belief in yourself and what you know and can do can help you carry yourself with more confidence. That type of confidence reflects in how you conduct yourself with the people you know and can help improve their perceptions of you. It’s not one of the most talked about benefits of continuing your education, but continuing your education may help you feel better about yourself and feel more confident around others. You’ll be a more informed individual who can contribute in a number of other situations. Your newfound knowledge and skills will help you stand out more in a crowd and help encourage your own confidence in yourself. People can return to school at any age. In fact, many older adults and working professionals are taking advantage of the opportunities provided by returning to college or earning additional degrees. Whether you’re returning to school simply because you want to grow personally or because you want to increase the chances of having a successful career, it’s important to plan out your additional education and understand why you’re returning to school. By doing so, you’ll improve your chance of feeling satisfied once your additional education has finished.